This is ridiculously embarrassing, but last week (after living in Texas for over two years) I got lost coming home from Target! I made one wrong turn and I had no idea where I was. It’s not like I haven’t been to Target a few times since moving here, it’s that I don’t pay attention when Brian drives, and I rely heavily on GPS when I drive. Yes, after two years I still use GPS! Not all the time… I know how to get to church, the grocery store, the airport, the mall, and pretty much everywhere I frequently go. However, if you’ve ever driven in Texas, you understand the plate of spaghetti that is the highways and the maze that is the frontage roads. Seriously, you can’t always just turn left to go left; sometimes it feels like you need an advanced navigation degree just to go from here to there. And, because of that, I have leaned heavily on my phone’s GPS. Too much, it appears. In the past when we’ve moved to a new city, I would force myself to learn landmarks, directions, and multiple ways to arrive at a given destination. I did that by getting lost and then not giving up; rather, I’d remind myself of the direction I needed to go and just press through, or make a U-turn. Now, I simply engage the GPS. When you think about it, the news channels we watch are our GPS into the world, politics, and sociology. We find our favorite anchors and we listen as they point us in the direction in which they want us to go, and we follow them. It’s just so much easier than paying attention to world events, doing research, or finding the way on our own. If we were on our own, we might get lost. We might get separated from the crowd. We might end up on a strange street, or at a destination we didn’t expect, and that can be fearful, so we let them lead us. We also have a spiritual GPS — the notes at the bottom of the page in our wonderful study Bibles, and commentaries — and oh how we love them! They point us in the right direction and explain to us what we’ve read. But, are we leaning too heavily on those notes? 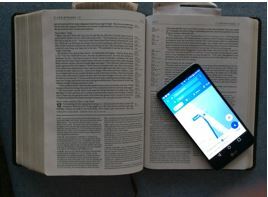 My phone GPS prevents me from learning my way around town; could the notes in my Bible hinder me from learning my way around the Bible? We know that the Holy Spirit will lead us into all truth (John 14:17), and we know that God will guide us (Psalm 119:105, 103), but sometimes it doesn’t seem like his voice is as clear or as readily available as the notes at the bottom of the page. God is a gentleman, unlike the GPS that over-rides the radio and blasts its directions, even daring to tell us to turn around when we’ve missed an intersection, God doesn’t shout over the cacophony of voices that tell us what to do, and where to go. God speaks quietly, and we must learn to listen. I’ve learned that it’s OK to get lost on the roads. It’s OK to have to struggle to find my way out, or through. It’s OK to not know where I am. It’s OK to wrestle with confusion and fear. It’s OK to look beyond the familiar. It is OK to be in uncharted territory. It’s OK to have to backtrack. Struggling to find my way enables me to discover new ways of getting to the same place, and often see new things along the way. When we read the Bible we shouldn’t be afraid of getting lost or not knowing our way around. Actually, it might be fun to have a more adventurous spirit when we read the Bible. We should be ready to explore, to follow the margin references, and when we arrive at that destination, continue following the additional references from there! Oh, the things we might discover for ourselves! We can always ask God for directions, but we need to learn to wait and listen while God answers them before we assume that we won’t hear him, or can’t hear him, and rush to read the commentaries. Amazingly, the same Holy Spirit who inspired the Bible, who gave his wisdom to the theologians who wrote the notes, will also lead us into truth. It’s not that we should discard the commentaries – oh no, we need them – but what are we missing by turning to them first? We miss hearing from God. We miss following him as his guiding hand personally directs us. The more familiar we are with God’s Word, the less likely we will be to get lost… or maybe the more likely we will be. After all, as we grow in familiarity with our surroundings the more likely we are to venture outside what we know, the more likely we are to look around, to peer beneath the surface, and to try to find hidden things. There are some really exciting destinations for our spirits between the front and back cover of our Bibles; don’t be afraid to search them out! When you encounter the unfamiliar why not go a little further and see what’s there before you turn to the notes to lead you back to familiar territory. Will you take a chance today and let God lead you deep into his Word? Will you explore with curiosity and trust that God’s Word will accomplish in you God’s purpose for you? And when you do read the commentary, don’t be surprised to find that you have arrived at the same destination as the commentator. I have just one question, why are you shopping at Target? 😂 Love you Marcia! Well as long as you stay out of Target! Love ya! So very true today. But the box we learn to live in is so safe and predictable!